As two major fires merged in the northwest, B.C. firefighters have had to contend with several new fires that have popped up in the southeast and the Okanagan. As two major fires merged in northwest B.C. overnight, firefighters have had to contend with several new blazes that popped up in the southeast and the Okanagan region. Three significant new wildfires were ignited Thursday in the southeastern corner of the province, including a 35-hectare blaze just 10 kilometres from the Salmo-area site of the Shambhala Music Festival — an annual electronic music event that was threatened by wildfire last year. The B.C. Wildfire Service says the festival isn't in any immediate danger this year, unlike in 2017, when its grounds were placed on evacuation alert. Large new wildfires are also burning northwest of Creston, within two kilometres of Highway 3, and northwest of Radium. Two evacuation alerts have been issued in connection with the three southeastern blazes, including one for the McArthur Creek area, southeast of Salmo, and another for the Cross River/Nipika Mountain Resort areas. In the Okanagan, firefighters are tangling with an aggressive new wildfire 24 kilometres west of West Kelowna that quickly grew to four square kilometres, but they say no structures are threatened. Meanwhile, in the northwest, the Alkali Lake and South Stikine River fires met overnight, with the combined blaze now ranging over 300 square kilometres, and the weather forecast doesn't look promising for the efforts to get it under control. Fire information officer Heather Rice said Wednesday that the merge itself isn't necessarily a bad thing. "Merging means we have one fire to deal with instead of two, so it can almost make it a little easier to deploy our resources to where we want them, to the primary areas in the flanks to pinch off the fire." The Alkali Lake fire had already burned through 27 structures in the area of Telegraph Creek earlier in the week. More than 250 residents have been unable to return to the area. B.C. Forests Minister Doug Donaldson said crews have established fire guards and structural protection units within the town, including industrial sprinklers. Highway 51 in both directions from Telegraph Creek to the Highway 37 junction in Dease Lake remained closed, with the fire burning alongside the roadway. Illustrating just how volatile the conditions are in B.C., a semi truck trailer full of wood chips caught fire Wednesday afternoon along Highway 3 near Hedley. The fire quickly spread to the nearby hillside before firefighters were able to extinguish it. Kevin Skrepnek, B.C. 's chief fire information officer, said the heat should let up across the province in the next day. "The real day we are focusing on right now is Friday," Skrepnek said from Kamloops. "We do expect a pretty dramatic shift in the weather." But with it comes forecasts of thunderstorms, lightning and only small amounts of rain. Skrepnek said the most recent forecast predicts between three and five millimetres of rain, which is not enough to ease the extreme fire conditions across B.C. Hot and smoky week ahead with advisories issued for large parts of B.C. "Unfortunately, with the system coming through, we are expecting a cold front that is going to bring about increased winds, and that is more than likely going to bring some thunderstorm activity with it," he said. "We are bracing for it to be a challenging day." There have been 1,564 wildfires in the province since April 1, burning about 1,186 square kilometres and costing $131 million to fight. B.C. spent about $650 million fighting forest fires in 2017. The Snowy Mountain wildfire near Keremeos is now 40 per cent contained. It remains 120 square kilometres in size. In the upper Fraser Valley, a brush fire ignited Wednesday along Highway 7 between Agassiz and Hope. Police believe it began when a vehicle with a flat tire pulled over to the side of the road. The fire prompted officials to close the highway in both directions on Thursday afternoon, and police say it could be closed for 24 hours. A wildfire burning south of Hope has led to the closure of Skagit Valley Provincial Park. The Verdun Mountain wildfire has grown to eight square kilometres. On Thursday, the Bulkley-Nechako Regional District expanded the evacuation order related to the blaze. 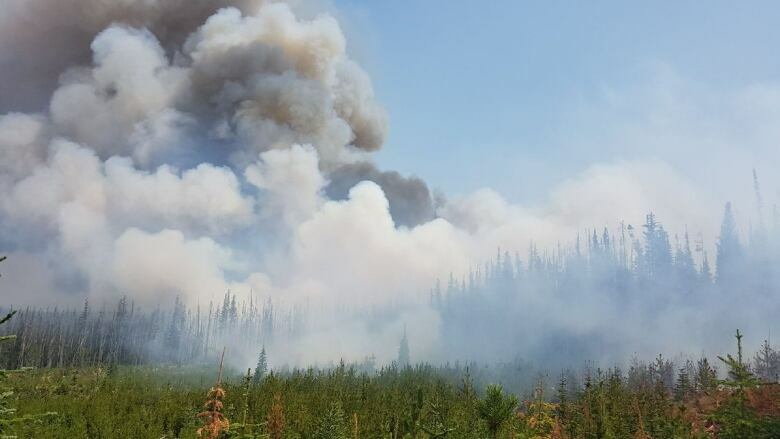 The Nadina Lake wildfire burning about 60 kilometres south of Houston is now 120 square kilometres in size, and regional officials expanded the related evacuation order and alert on Thursday. Further north, homes in the Elbow Lake area were ordered evacuated because of the Elbow Lake fire, which covers almost 6.7 square kilometres. Structural protection crews are working on saving some cabins. Highway 93 South through Kootenay National Park remains closed due to work on the Wardle wildfire. All regional parks in Metro Vancouver are under an extreme fire danger rating. Campfires and barbecues are prohibited. The campfire ban across most of the province has been expanded to Haida Gwaii due to unseasonably dry and hot conditions. Buildings destroyed in Telegraph Creek area as wildfires rage in northern B.C.